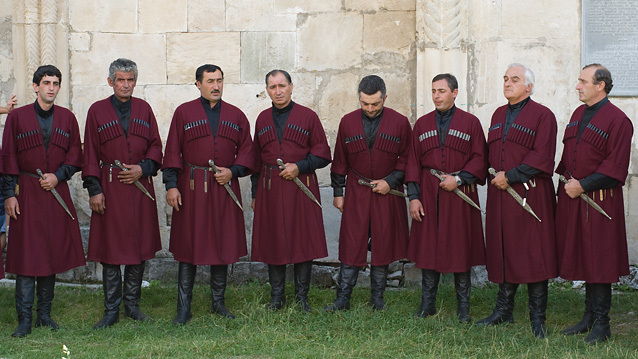 Georgian singers in traditional outfit in Nikortsminda..
said about the relationship between Georgia and the separatists in their breakout republics Abkhazia and South-Ossetia, both militarily supported by Russia. One could imagine that Georgia is much like a Mediterranean country. But Georgia is a mix between western and eastern culture, and cannot be placed in either basket. That is what fascinated many travelers in the early nineteen hundreds and drew artists and writers from all corners of the world to Tbilisi; the multicultural capitol. Now Georgia is torn between the western influence, mainly USA, and their traditional relations to Russia. 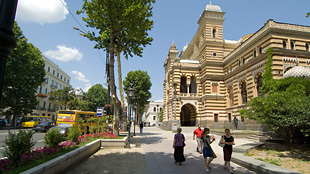 The Orthodox church has a firm standing in the Georgian mind together with rich folkloristic traditions like singing and dancing. It’s said that the first Europeans emerged from Georgia, thus the expression Caucasian. Georgia is a country of wine lovers and producers. Wine has a central position in most activities, and the Khvanchkara, Stalin’s favorite wine grown in the Racha region is probably the most famous of them all. The strife has for years been fueled by the Russian involvement against Georgian territorial integrity by supporting the breakout republics. Russia has handed out Russian passports and supplied the separatists with guns and armor for many years. 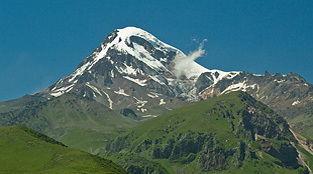 The conflict finally erupted in 2008, when Russian troops invaded Georgia under the pretext of protecting Russian citizens in South Ossetia, and recognized both rebel republics as sovereign states in September 2008. Besides Russia only Venezuela and Hamas has recognized the rebel republics. 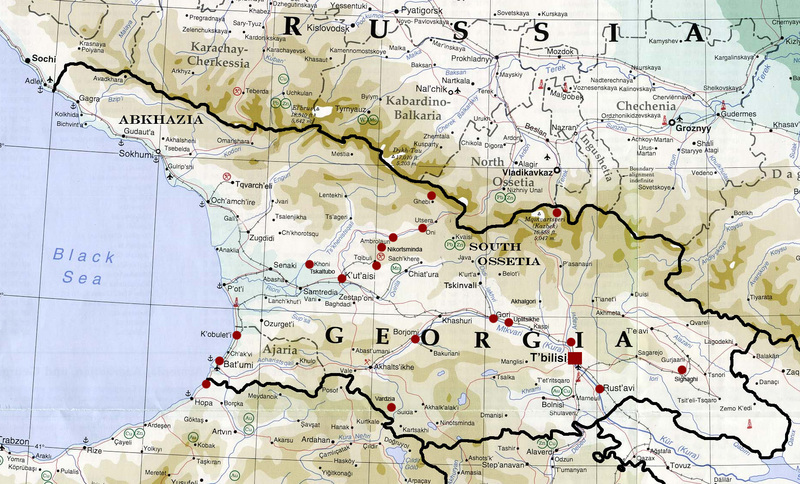 Russian troops still holds positions in Georgia in spite of a ceasefire agreement brokered by France in August, and have stationed troops in the rebel republics. Georgia’s application for NATO membership and US missile shield in Poland has been mentioned as the overarching reason for Russia to occupy Georgian territory. Unemployment rates around 60% is mentioned, but not verified by the authorities. Georgia is still one of the nations where people have an average income of around 1$ a day. Still hospitality knows no limits, and the Georgians use every possible mean to treat their guest like kings and queens, even if that means less food on the table the next week. 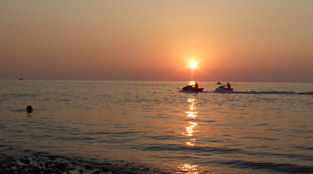 Investment and business activity is picking up in Tbilisis. Forreign investors place huge amounts of capital in city buildings, hotels and finance. But investments are scarce in the rest of the country. That development speeds up the urbanization and many live in severe poverty in the worn out buildings in the outskirts of Tbilisi. During my traveling here since 2004, I could see clear signs of improvement in the infrastructure also in rural areas. Road building, better power supply, and a growing awareness of tourism combined with huge investment in new tourist resorts. According to the IMF Georgia’s economy is blooming. From being number 112 on the ranking for business climate, Georgia is now number 15. But the war with Russia in August 2008 might have damaged this. Get more detailed information about the country. 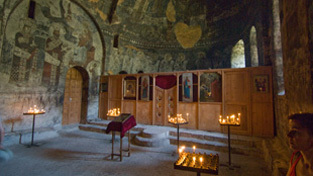 Chapel inside the mountains in Vardzia.